Explanation: While hunting for meteors in the night sky above the White Mountains near Bishop, California, astrophotographer James Young instead captured this brilliant celestial apparition. Recorded near twilight on August 13, the bright streak is not the flash of a meteor trail but sunlight glinting from a satellite. The satellite, Iridium 52, is one of a constellation of Iridium digital communication satellites in Earth orbit known for producing stunning, predictable "flares" as they momentarily reflect sunlight from shiny antenna surfaces. For well placed observers, the peak brightness of this Iridium satellite flare reached about -6 magnitude, not quite as bright as the half illuminated moon. 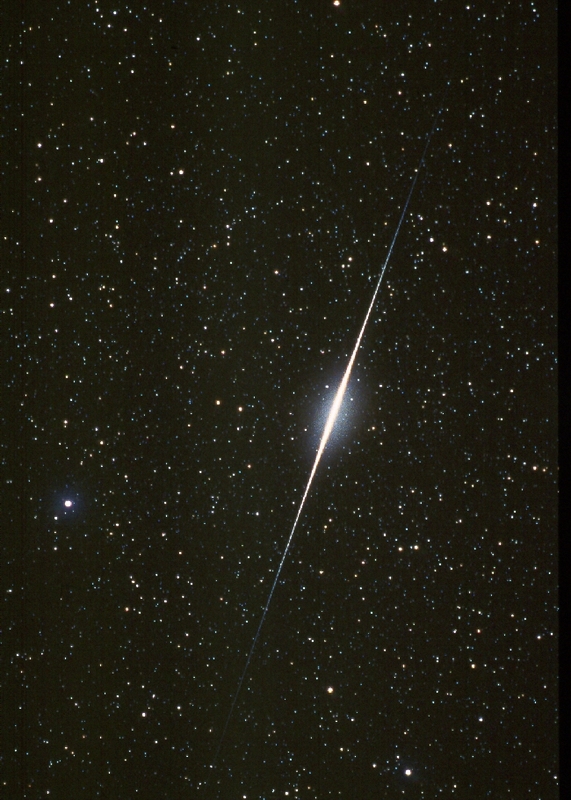 At magnitude 2.5, the bright star at the left is Alpha Pegasi, a star in the constellation Pegasus.